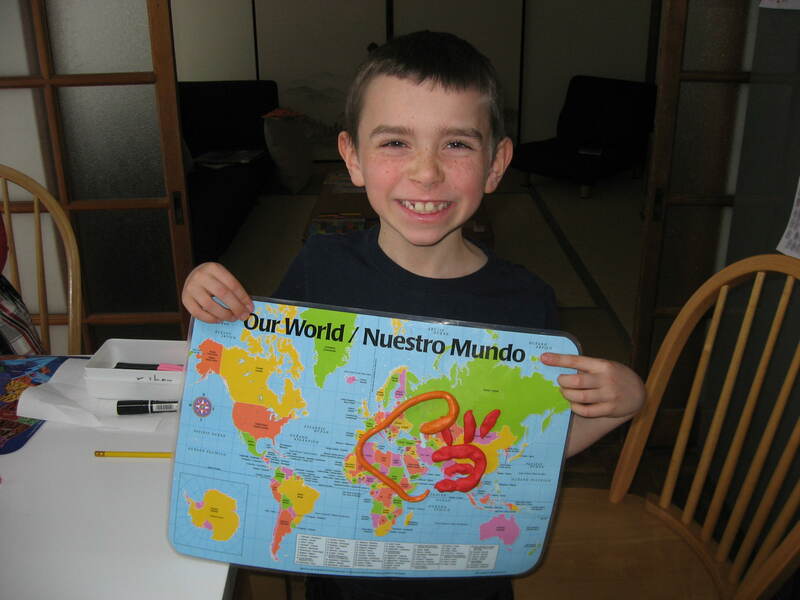 Sometimes it can be overwhelming to think about needing to learn between 150 to 200 new Japanese-style Chinese characters (called kanji) every year when you are an elementary school-aged boy who is also learning to read and write well in English and (frankly) would much rather be out playing sports or building with Legos than writing the kanji characters over and over again to memorize them. 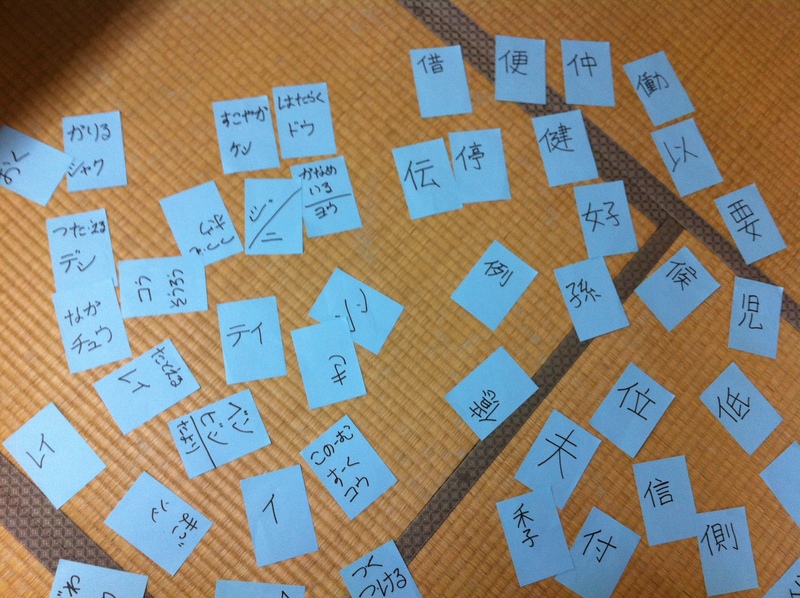 So, I’ve recently been trying to think of ways to put a little more excitement and variety into the kanji learning experience. 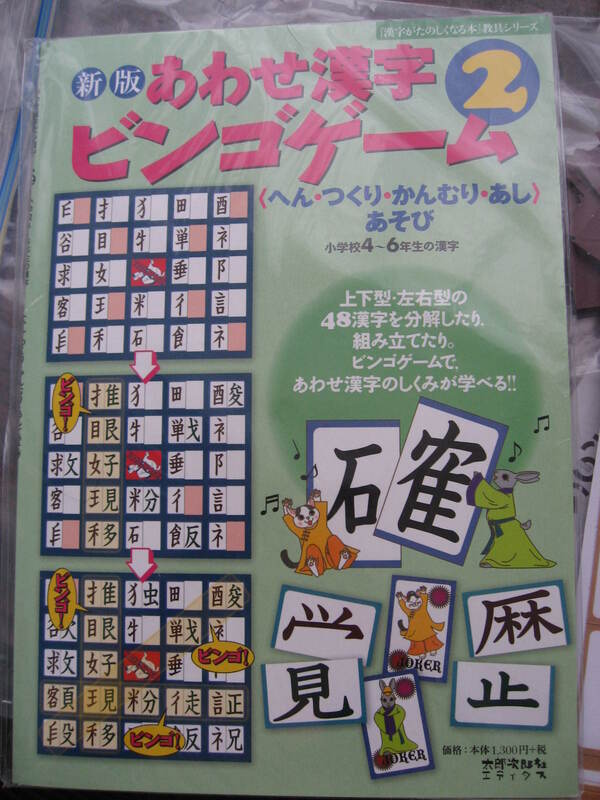 Another thing I’ve done is to purchase a kanji bingo game from Amazon Japan. 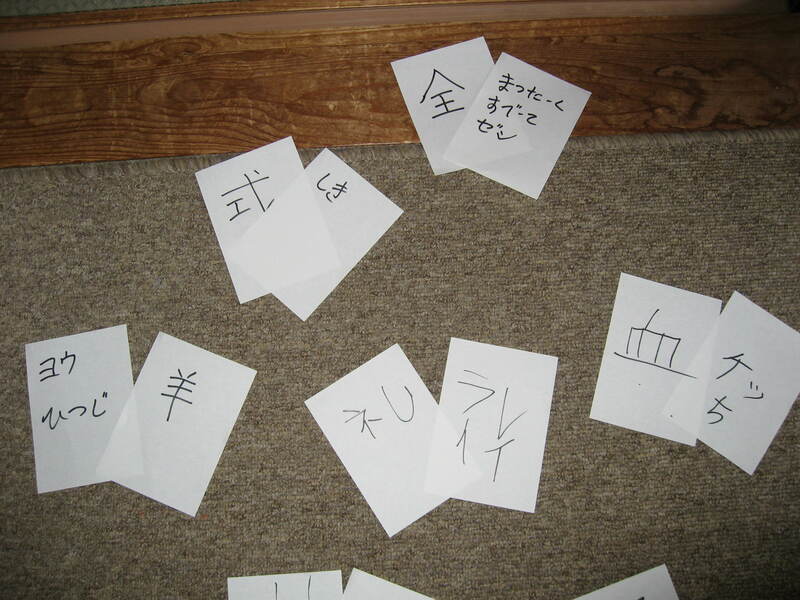 When I bought the game, I thought it would include cards for all the second and third grade kanji, but unfortunately it only included a few of each level. So, I used the boys’ textbooks to make many more cards for the game and then divided them into sets. 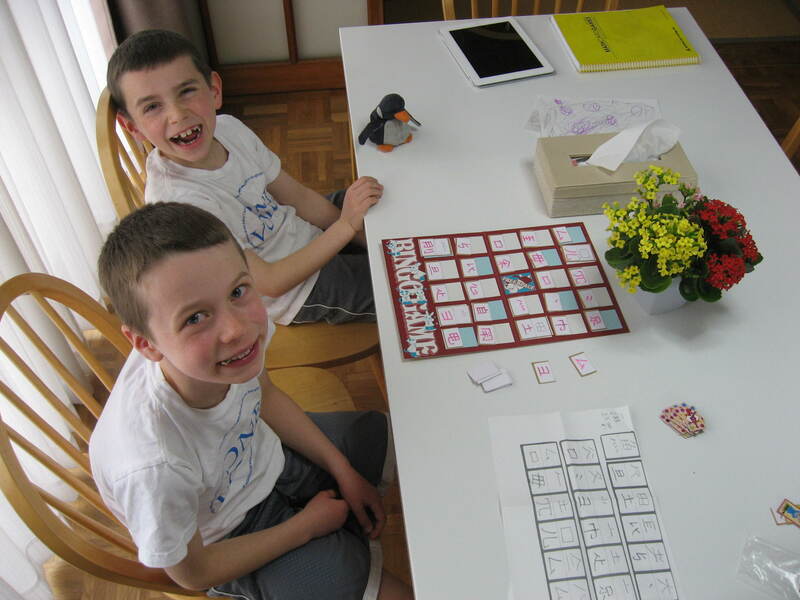 Playing kanji bingo helps the kids (and the mom!) 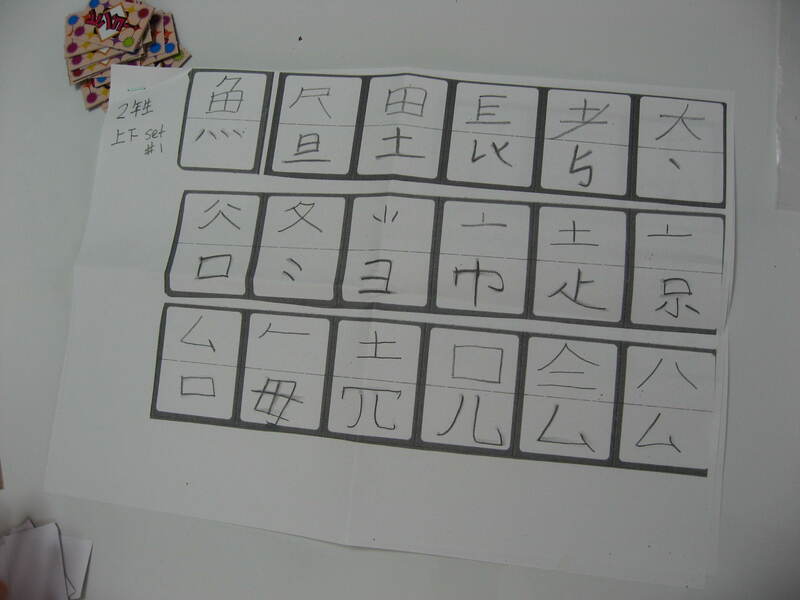 to think about the parts that make up each character since you must match either the top half of the kanji with the bottom half or the right side with the left side to play the game. We can also use the cards to play a rousing game of “Old Maid”. An educational consultant told me that taking a multi-sensory approach to learning the characters can be really effective. 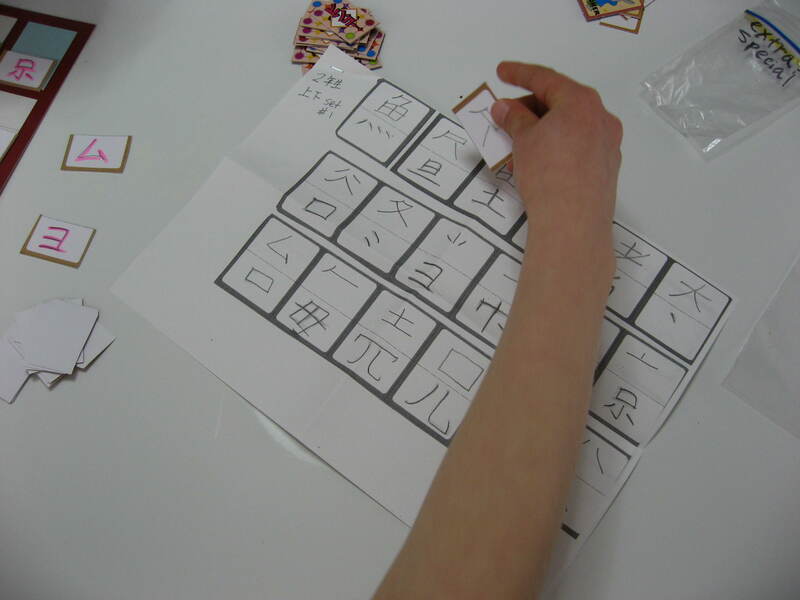 Instead of simply writing them on paper with pencil, she suggested having the kids use their fingers to “write” the kanji on a rough surface like sandpaper to help it stick in their brains. I liked her sandpaper idea, but decided to choose more interesting surfaces like a square of fake grass, colorful corrogated cardboard, and a wide scrubbing sponge. 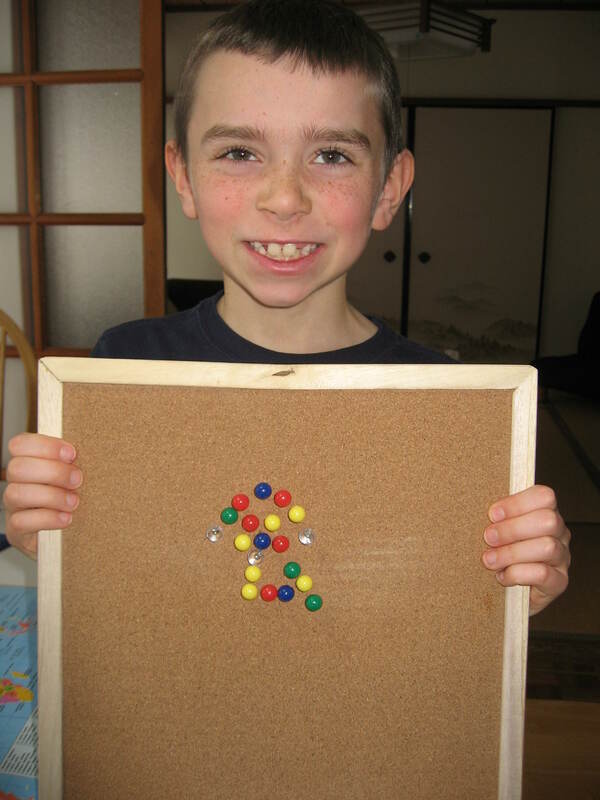 We’ve also tried making the kanji with playdoh, pipe cleaners, and glitter glue, and by forming them on a cork board with push pins. 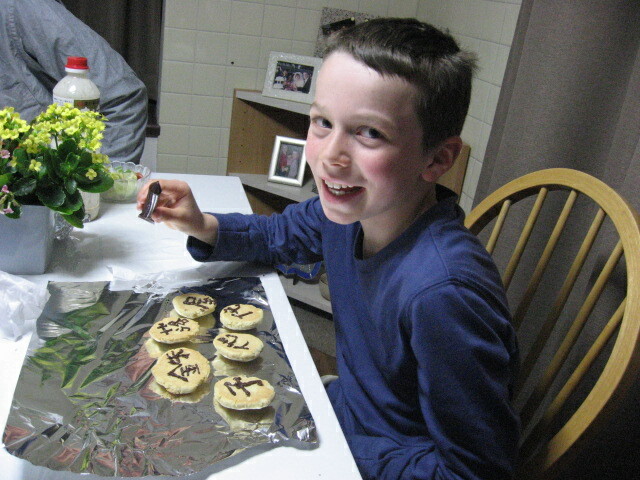 But the most delicious study method we’ve done so far is to have the boys write them on sugar cookies using a chocolate pen — yum!! 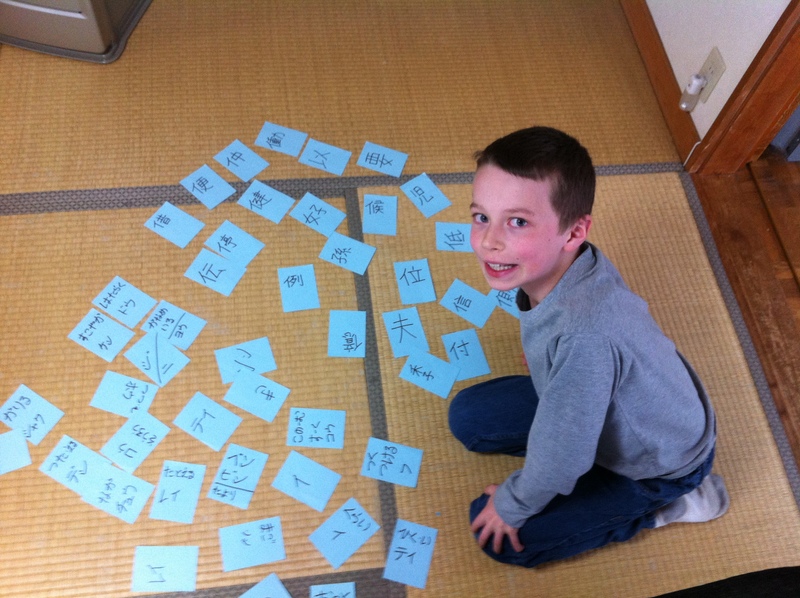 My hope is that these non-traditional ways of practicing the characters will help make the kanji easier for the kids to remember and also help them develop the feeling that memorizing kanji can actually be fun. 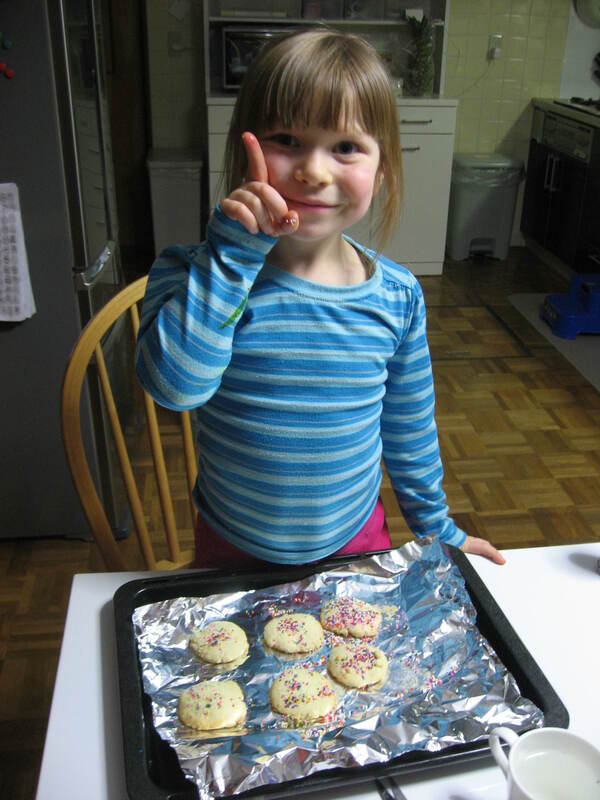 So far, my students have given these activities rave reviews! 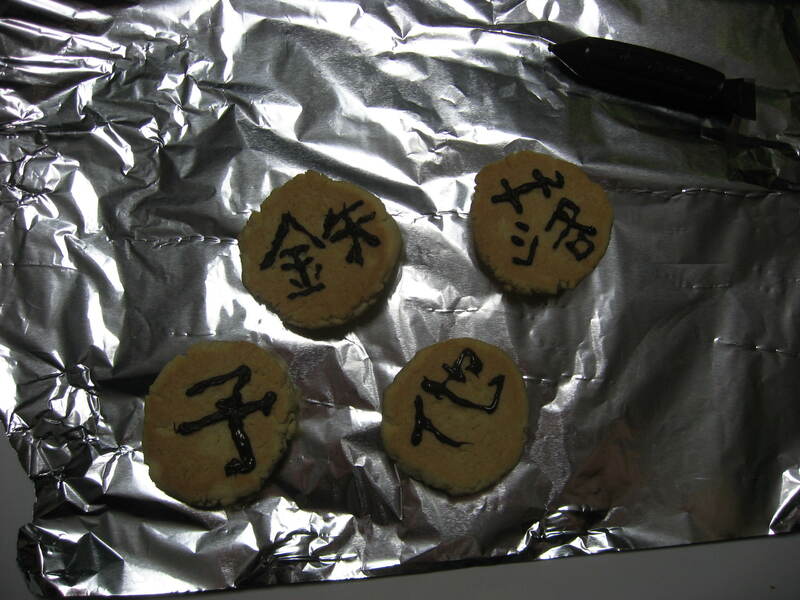 What could be better than kanji on a cookie?! 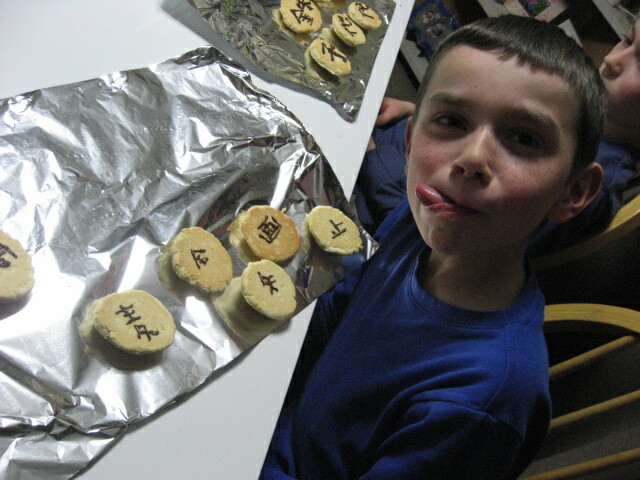 Katie wasn’t quite ready to draw any kanji on her cookies, so she just went with rainbow sprinkles. 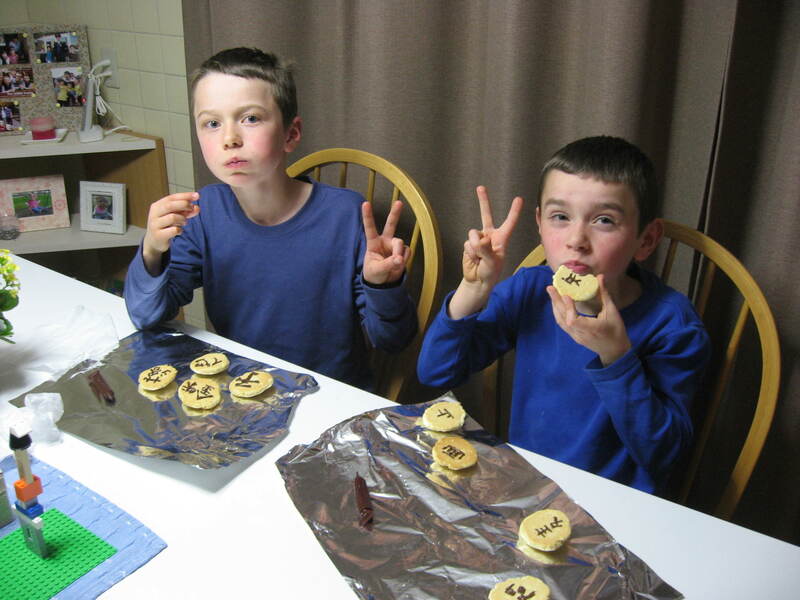 The boys used chocolate pens to practice some of their kanji from this week. 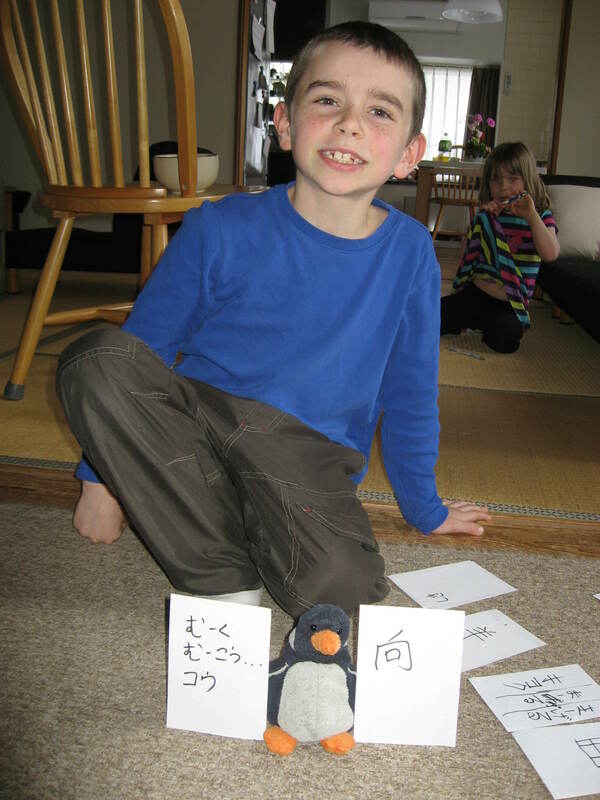 The kids posing with some of their multisensory kanji learning materials. 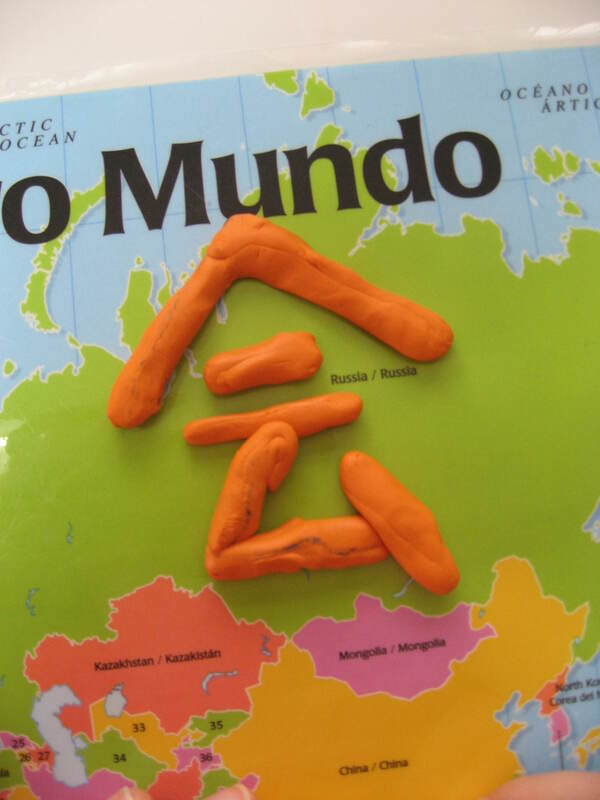 Ethan tried his hand at making a stick-pin version of the kanji “au”. 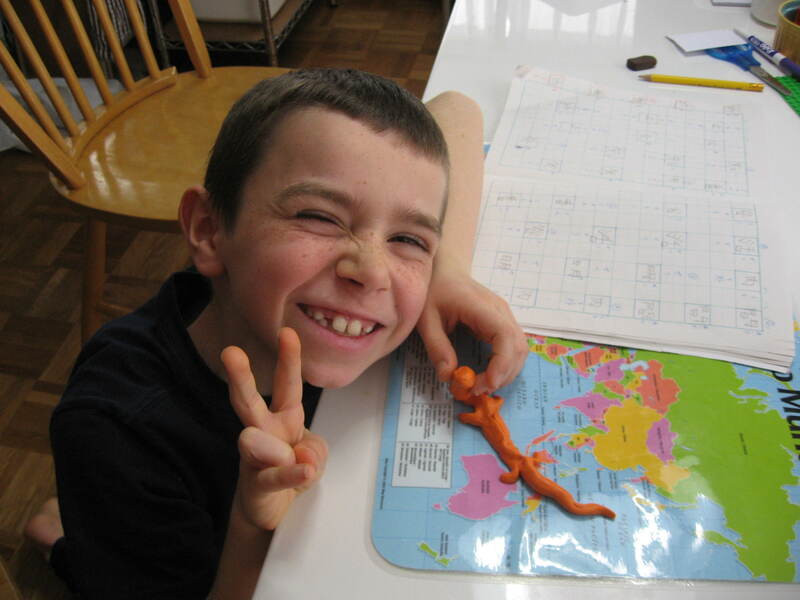 Ethan with the Kanji “ataru” and a Play Doh snake. 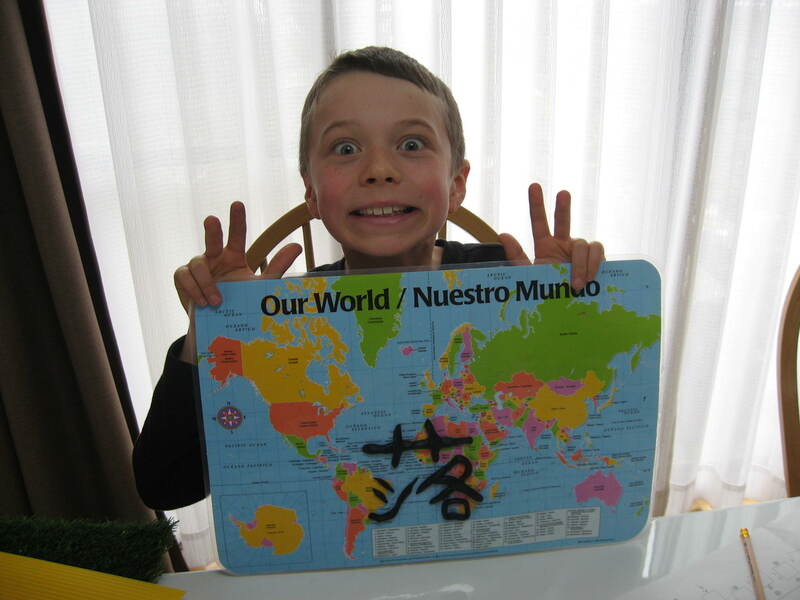 We used the world map placemats to protect the table. 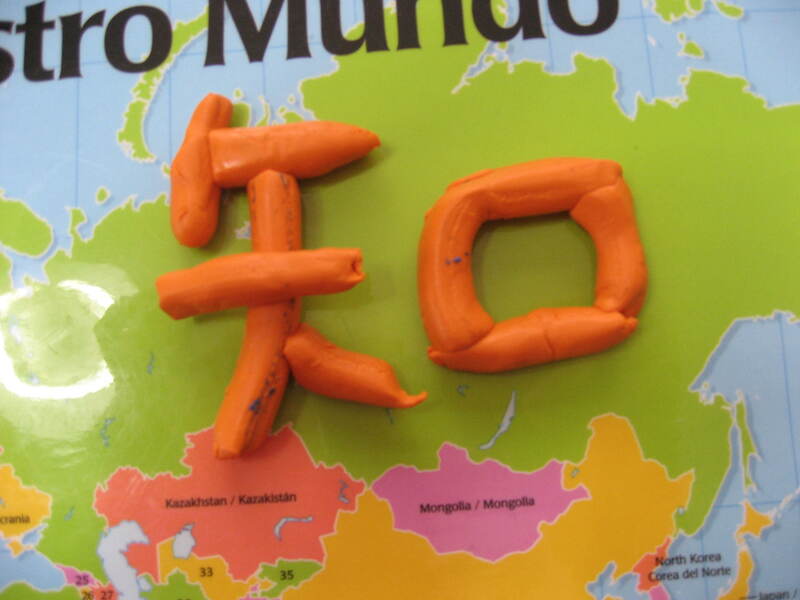 Of course, you can’t JUST make kanji with the playdoh. 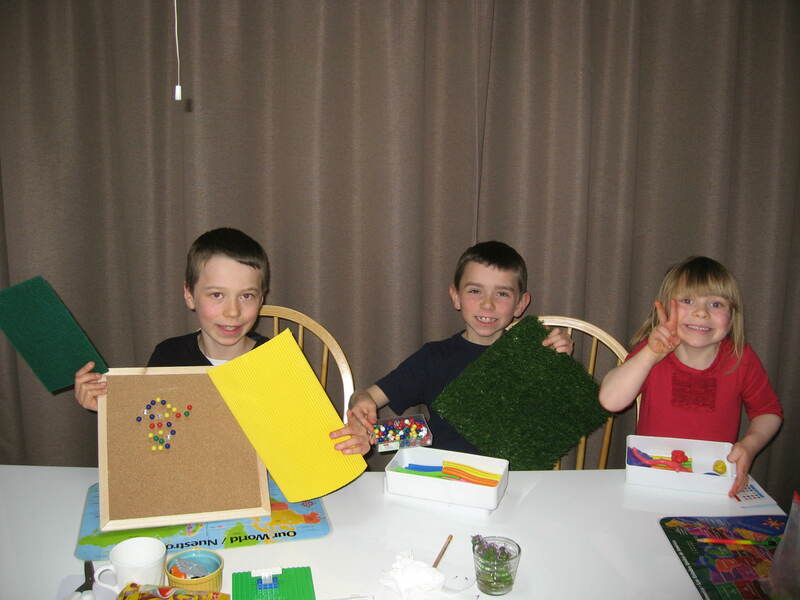 You have to make snakes and other creatures too! 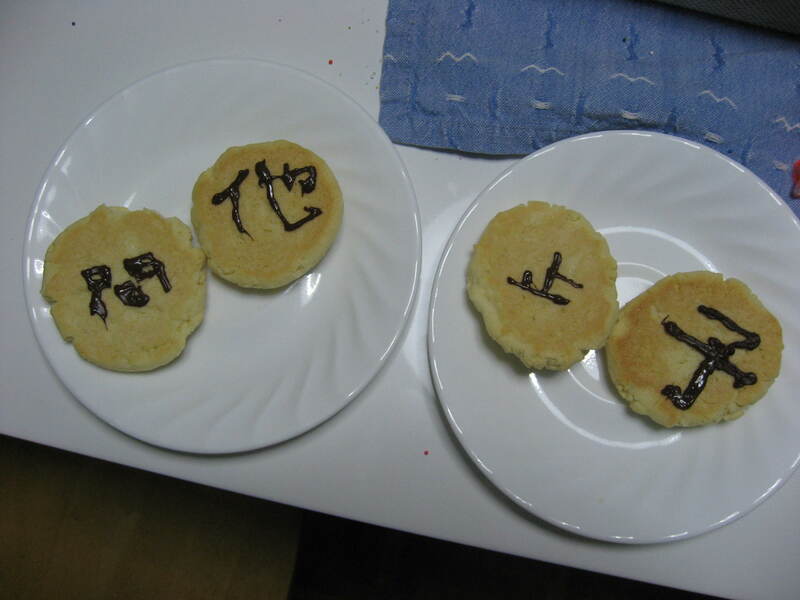 This is the kanji “au”, which means “to meet”. 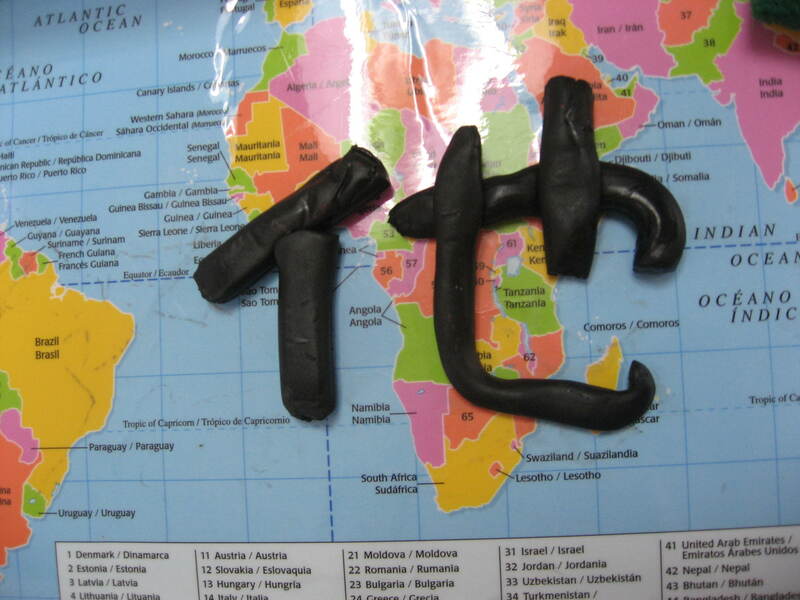 This is the kanji “ta” or “hoka”. 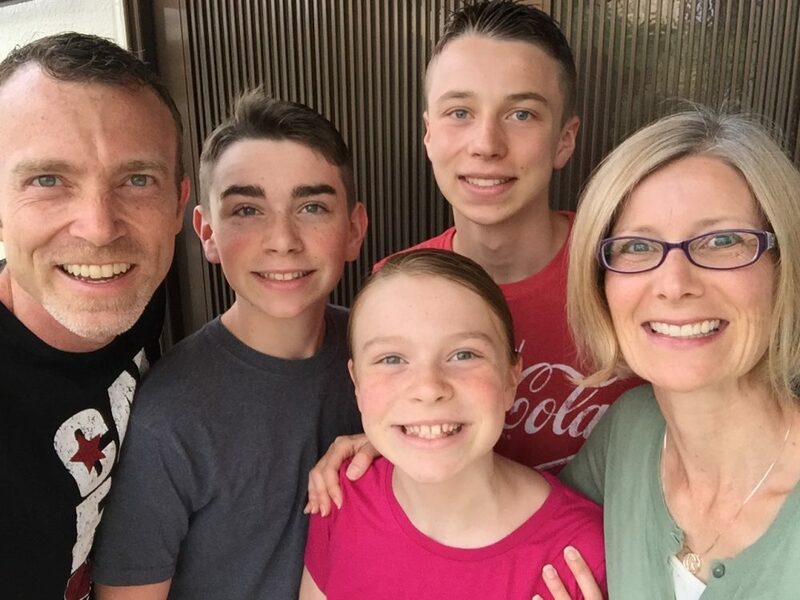 It means “other”. 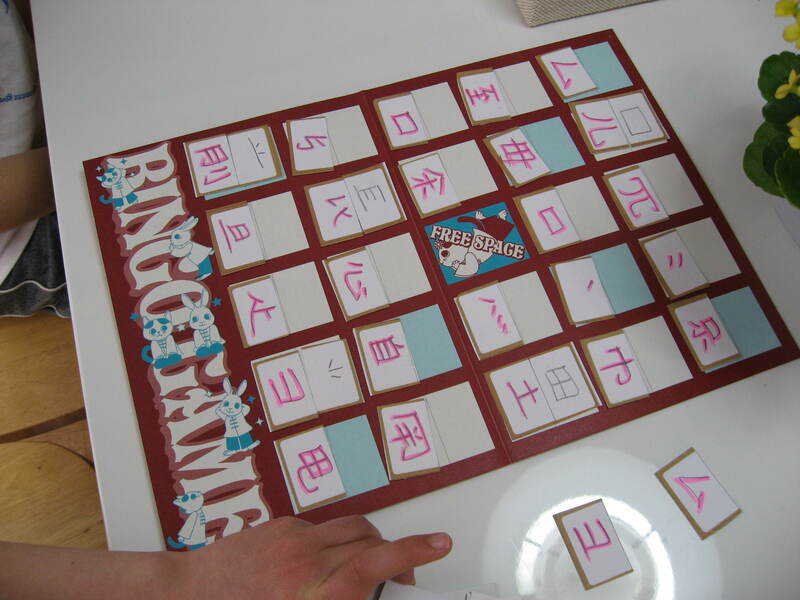 Kanji bingo for 4-6th grade kanji — we’re prepared! 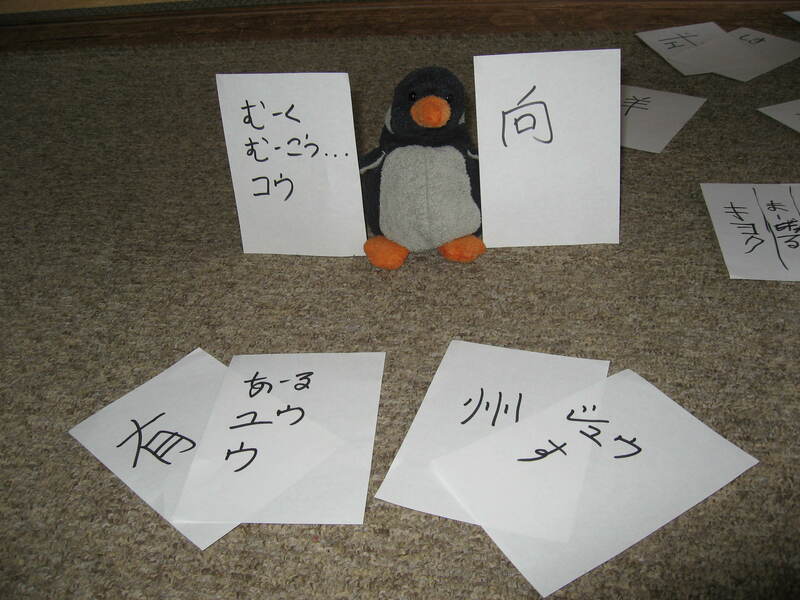 Checking the answer sheet to figure out which kanji piece makes a pair with theirs.